As I have said before, my wife is constantly insisting that I have three of every woodworking tool ever invented. Of course that’s not true. There are many of them that I only have two of. (However, at last count I had 37 different chisels, 28 pairs of pliers and 19 sharpening stones.) Now please understand; I’m not one of those tool- collector guys who own lots of shiny new tools – but hardly ever makes anything with them. I assure you, all of my tools are well used – I usually have about five or six projects going at any one time – and all are kept sharp and ready to use at a moment’s notice. In addition, I also have a usual complement of power tools – table saw, drill press, lathe, band saw, etc, etc. Not to mention all sorts of sanding, clamping, gluing, and finishing supplies and other goodies. I was 86 years old on my last birthday in October. I’m still active and going strong and I keep saying that I plan to live forever. (So far, so good.) But I also know that one of these days, those tools will need to be looking for a good home – preferably with someone who will both appreciate them and use them with the care and love that I have. I figure that my collection is worth somewhere around $30,000 and one option would be for my wife to sell them and enjoy the proceeds. Trouble is, she surely doesn’t know the value of most of them and wouldn’t know their fair market value. And it would make me turn over in my grave to have her sell one of my $45.00 chisels for 25¢ at a garage sale to some guy who would turn around and sell it for $2.00 at a swap meet. Of course I’m sure someone will ask, “Why not pass the collection along to your children?” Neither of my grown children would be interested. Neither would any of my step-sons. It has also occurred to me that another perhaps even better idea would be for her to donate the entire lot to some school or organization that would put it to good use training the future woodworkers of America. I would love to hear from some of my fellow woodworkers out there about their ideas or suggestions for solving my problem. Thanks in advance. Paul, I certainly see your dilemma and I’m here to help. You can just leave them to me in your will and I will give them a nice loving home. The only problem I see is in your plans for immortality. Since I don’t share those aspirations you will apparently outlive me. I don’t know if you have a very active woodworking guild where you live, but where I am (Greenville, SC) our guild has a bi-annual tool auction. 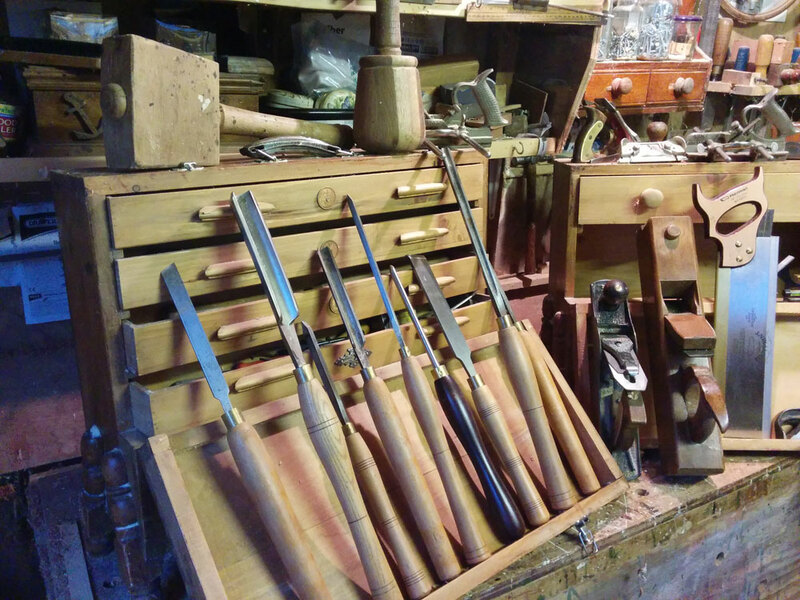 At nearly every auction there seems to be a tool collection from one of our members who has recently passed, and all of the auction proceeds for that member’s tools are either donated to the guild or given back to the member’s widow or family (whichever he had decided). It seems like a good option to keep the tools in woodworker’s hands who will both pay a fair value for them and continue to use and appreciate them. I’m also a member of the Greenville Woodworkers Guild. Another benefit is the guild is a non profit so a donation is tax deductible. In this case the tools find a good home and your beneficiary gets a deduction to offset cash or property they also inherit. Talk to your lawyer about the estate and include a plan to donate the tools to a charity you support through the beneficiary. Have you considered taking on an apprentice and leaving the tools to the apprentice? That way you can teach him or her, the value of the tools, the work they are designed to do and in the end they will have the tools to continue on you heritage. A Win-Win situation for both parties! My hand tool collection is probably worth 25k, and I always keep the data up to date, if for no other reason than insurance purposes. Paul, I am 75 and having the same concerns. I would like my extensive tool collection to be donated to talented and deserving young woodworkers who cannot afford them. I belong to the Society of Period American Furniture Makers, SAPFM. I believe that they are in an ideal position to act as a clearing center for these tools but I don’t seem to be able to generate any interest in providing this service. I don’t know what part of the country you are located in, but I am also associated with a woodworking group “Northeastern Woodworkers Assoc.” In the Albany, NY area. We do a similar thing as the Greenville group. Each September we have a Lumber and Tool auction that is specifically advertised to woodworkers in general, and open to the public. Lumber and tools are donated, either 100% or 50%/50% split, and the proceeds go to our Fiske Fund, which provides grants to woodworkers to attend classes taught by professional woodworkers around the country. Our organization is a 501c3 non-profit organization, so the donations are fully tax deductible. If you are in this area, look us up at http://www.woodworker.org and check us out. Otherwise, look for an organization near you for the possibility of a similar opportunity. Good luck, and may you continue many more years. I’m 80 with the same concerns. I have done 2 things. 1) talked with the Community College shop director and he will accept the tools when I’m gone. and 2) I keep a list of all the tools I purchased including the date and amount paid for them so if my wife and kids decide to sell them they will have some idea what they may be worth. My collection is well over $40,000. I can’t say that I have much in the way of ideas to add, but I do want to say that I appreciate the article and suggestions made. I like the idea of an apprentice, but that may be difficult where I live. I think the Greenville Guild is fortunate with it’s members. I will consider passing my tools to my grandsons (if they show interest — they are just approaching teenage) or possibly to our local community college. Frankly, even with a good database of tools and value, I doubt that the family will recover much for used tools. The tools needs a person or organization that would value them as is and be willing to restore and/or keep them up. I’m not quite to your age, but close, so understand your dilemma (though I don’t share it; my sons in law are both woodworkers, and I am just starting my grandsons out, so my tools will continue to be actively used after go to the great handtool workshop in the sky). I don’t know where you live, but there are some nonprofit schools of woodworking which could make good use of your collection in several ways. First, they could fill out their own needs for teaching tools. Second, they could pass tools on to students in the school who are slowly building their collections but don’t yet have the income to buy all that they need. Third, if any aren’t needed for either of these purposes, they could sell them to support the work of the school. They would know appropriate values, so wouldn’t sell a Lie-Nielsen shooting board plane for $5! And they would in a position to give a fair valuation of the collection for tax purposes. The Port Townsend School of Woodworking in Port Townsend, Wa., is one school where I have attended sessions. It’s well respected: Jim Tolpin, author of By Hand and Eye, The New Traditional Woodworker, and other woodworking books was one of the founders of the school, designed much of their handtool curriculum, and is still actively involved with the school. Many fine teachers have shared their talents there, such as Mary May, Jarrod Stone Dahl, Garrett Hack, and many others. They are still building their programs and are introducing many new woodworkers to the art and craft, and I am quite sure would respect, appreciate, and make good use of any donations they received. Of course, that’s only one such school; there are presumably many others you could investigate. You might ask if someone has a deserving apprentice already. I happened on a saddle making class, just as a little old lady showed up. Her husband had passed away and the one teaching the class had been designated as an up and comer whom her husband had designated to get the tools. She just explained that and gave them to him and left. My greatest fear is, after i die, my wife will sell my tools for what I told her I paid for them! Donate (if you can) to a startup guild or school. Next best thing is an auction but you probably should not attend without a box of kleenex. Paul this is a difficult situation, well here comes story. When I was younger 24, now young 67, worked with a 4 generation black smith. He would take his pair tools had 3-4-5 of and when some one he met liked would just give him some thing. Seamed to always have some thing to give away. seams simplistic but worked for him. I have promised several of my larger power tools to friends, after asking them what they would like. Of coarse if I upgrade then I have the problem of wether to give them the old or the new tools. The rest will go to either a school or the local cabinet shop, after all you cannot have enough clamps. Hi, I think it’s a great idea to find a nice young lad like myself with a young family to donate all your tools too. I started building furniture because I got laid off of work to make ends meet and my business now keeps growing. I teach my 2 and 4 year old everything I know about woodworking which I learned from my dad. My dad passed some of the tools he had onto me and now those tools have about seen there last days due to the fact I use them all day and everyday to build. What I’m saying is I’ve got a good long time to keep good tools working and the kids to pass them onto when their ready. I really appreciated this article and all the comments. My dad died 4 years ago and my husband and I were supposed to receive all his tools because my husband was the only one who would use them. Dewalt, craftsman, etc., only the best of anything. We were only allowed to have the woodworking items. Now my husband has died and I unfortunately have no use for the tools. People try to jip you down to pennies, and while I know nothing about the equipment, I know it could easily bring half the new price. I will look into guilds, schools and possibly auctions to get rid of all of it. Sadly I need the money more than I have time to learn woodworking. Thanks for the info.